TURBOLENZA Videos: We are not crazy... WE ARE AMAZING! When I’m feeling down , I’m always watching this! This is just AMAZING! And actually tomorrow I’m going to jump for the first time with parachute! Pure Adrenaline Basejump! Editing by Vania Da Rui. 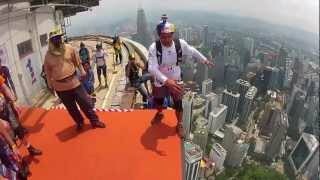 SoulFlyers Fred Fugen & JP Teffaud basejumping at Menara Kuala Lumpur 2012 Event.